A classic Cabbages & Roses frock, made from beautifully soft, machine washable cotton with a gentle subtle stripe. The low loose waist and softly voluminous skirt makes Herman the easiest dress you will ever own, dressed up or dressed down. Ankle skimming in length Herman is a perennial favourite with her striking profile and generous fit. 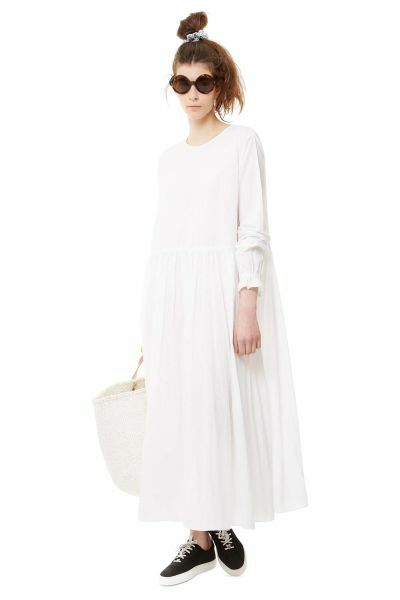 Our classic Herman dress is back in fresh white cotton. An oversized smock dress, the waistline is wide and designed to sit away from the body. Herman has extra long sleeves, he has elasticated cuffs for comfort. A small flounce at the cuff finishes it all off perfectly. 1 Cabbages & Roses engraved button fastens the centre back neckline. With a gathered skirt, Herman has been designed to insume you. The only fitted part being the elasticated cuff, you will never be comfier. Herman is unlined.